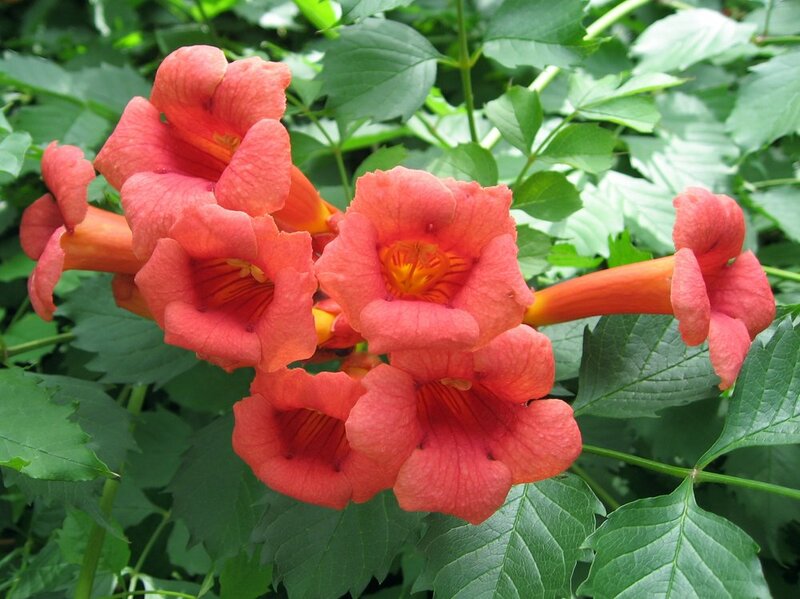 With its impressive bulk and those stunning tubular red flowers, one would be excused for thinking that the trumpet creeper (Campsis radicans) was a tropical vine. Indeed, the family to which it belongs, Bignoniaceae, is largely tropical in its distribution. There are a handful of temperate representatives, however, and the trumpet creeper is one of the most popular. Its beauty aside, this plant is absolutely fascinating. As many of you probably know, the trumpet creeper can reach massive proportions. In the garden, this can often result in collapsed structures as its weight and speed of growth is something few adequately prepare for. In the wild, I most often see this vine in somewhat disturbed forests, usually near a floodplain. As such, it is supremely adapted to take a hit and keep on growing year after year. One of the many reasons this plant performs so well both where it is native and where it is not is that it recruits body guards. This is easy to witness in a garden setting as the branches and especially the flowers are frequently crawling with ants. Trumpet creepers trade food for protection via specialized organs called extrafloral nectaries. These structures secrete sugary nectar that is readily sucked up by tenacious ants. When a worker ant finds a vine, more workers are soon to follow. Amazingly for a temperate plant, trumpet creepers produce more extrafloral nectaries of all four categories - petiole, calyx, corolla, and fruit. What this means is that all of the important organs are covered in insects that viciously attack anything that might threaten this sugary food supply. Hassle one of these vines at your own peril. With its photosynthetic and reproductive structures protected, trumpet creepers make a nice living once established. Reproduction is another fascinating aspect of trumpet creeper biology. A closer inspection of the floral anatomy will reveal a bilobed stigma. Amazingly, this stigma has the ability to open and close as potential pollinators visit the flowers. Stigmatic movement in the trumpet creeper has attracted a bit of attention from researchers over the years. What is its function? Evidence suggests that the opening and closing of the lobed stigma is way of increasing the chances of pollination. Touch alone is not enough to trigger the movement. However, when researchers dusted pollen onto the stigma, then it began to close. What's more, this action happens within 15 to 60 seconds. Amazingly, there appears to be a threshold to whether the stigma stays closed or reopens after 3 hours or so. It turns out, the threshold seems to depend on the amount of pollen being deposited. Only after 350 grains found their way onto the stigma did it close permanently. Experts feel that this a means by which the plant ensured ample seed set. If too few pollen grains end up on the stigma, the plant risks not having all of its ovules fertilized. By permanently closing after enough pollen grains are present, the plant can ensure that the pollen grains can germinate and fertilize the ovules without being brushed off. It is interesting to note that the flowers frequently remain on the plant after they have been fertilized. This likely serves to maintain a largely floral display that continues to attract pollinators until most of the flowers have been pollinated. Speaking of pollinators, observations have revealed that the trumpet creeper is pollinated primarily by ruby-throated hummingbirds. Although insects like bumblebees frequently visit these blooms, bringing pollen with them in the process, hummingbirds, on average, bring and deposit 10 times as much pollen as any other visitor. And, considering the threshold on pollen mentioned above, trumpet creeper appears to have evolved a pollination syndrome with these lovely little birds.